Our La Canada Flintridge car accident lawyers and law firm provide expert personal injury legal services for those injured in auto, motorcycle and other accidents, and for the relatives and families of those killed in car and other accidents for wrongful death claims, in La Canada Flintridge, California, a city of 20,246 people, located in Los Angeles County, California. If you had a car accident or other personal injury claim in La Canada Flintridge or anywhere else in California, please contact our injury attorneys and legal team now for a FREE CONSULTATION. We also invite you to see our Car Accident Web Site by clicking here for much additional helpful information. La Canada Flintridge is home to NASA's Jet Propulsion Laboratory (JPL), the center for the robotic exploration of the solar system. 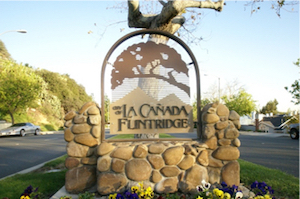 La Canada Flintridge is also bordered by Pasadena, Glendale, Burbank and Altadena. If you do not have an insurance card, you may simply request a copy from your insurance agent or insurance company. Be sure you have appropriate insurance coverage to not just pay any possible claims made against you by other parties, but also to protect your family and you. You may contact your insurance agent or our law firm for some helpful advice on insurance coverage. A La Canada Flintridge car accident can be dangerous, traumatizing and even fatal for the victims involved and can result in painful injury so it is so very important to have an experienced car accident lawyer on your side. Our more than 40 years of accomplishment in handling car accident and other personal injury cases in La Canada Flintridge, Los Angeles and throughout California has given us the recognition of PERSONAL INJURY LAW FIRM OF THE YEAR and two of our attorneys, Robert Walch and Gary Walch, were each selected as Top Lawyers in California (Highest in Ethical Standards & Professional Excellence). Our aggressive but compassionate attorneys and staff have resolved thousands and thousands of cases and work extremely hard to make the claims process trouble-free for our clients, the victims and their families. We invite you to visit our new and updated Car Accident Web Site. More than $100,000,000.00 in funds has been recovered by The Walch Law Corporation for its clients; and our firm also offers the victims of car accidents assistance with medical care (regularly without any payment until the case is resolved), specialists, property damage repair and settlement. You can find out more about what our clients have to say about us on our Car Accident Testimonial Pages simply by clicking here. One serious injury that our clients of car accidents and motorcycle accidents in La Canada experience is spinal cord injury. The spinal cord is a long, thin, tube of nerves, tissue and cells that extends from the brain to the low back. A spinal cord injury occurs when there is damage to the spinal cord from trauma, loss of its normal blood supply, or compression from tumor or infection. The most common cause of spinal cord injury is trauma. Nearly half of these injuries are caused by motor vehicle accidents, including car accidents, motorcycle accidents and truck collisions. 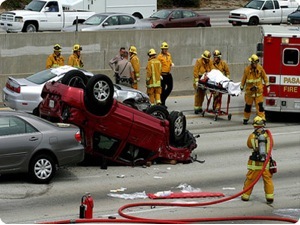 An automobile accident is a serious issue that can lead to disastrous outcomes and have ongoing effects on the victims involved so it is very important to have a qualified and experienced attorney on your side.If you or someone you care about sustained any spinal cord injuries from any car accident or other personal injury accident in La Canada Flintridgeor anywhere in California, please contact us now, including for referrals to doctors who may provide treatment without expecting any payment until the claim is resolved. The Law Offices of Gary K. Walch offer you the strong representation and advocacy that you need when you or a loved one has been through a difficult car accident or other personal injury accident in La Canada Flintridge, Los Angeles or anywhere in California. It is our job to best represent your interests and aggressively pursue your rights. Our staff handles accidents involving car, motorcycle, truck, bus, train, bicycle, pedestrian, hit and run, uninsured motorist (UM) and much more. Call us for an absolutely FREE consultation to review and analyze your car accident or other personal injury case. For your convenience you don’t even need to leave the comfort of your own home. Just like many of our clients you can do everything by telephone at 818-222-3400 or toll free 866 INJURY 2 (465879 2), email (info@WalchLaw.com) or simply complete our very easy to use contact form.